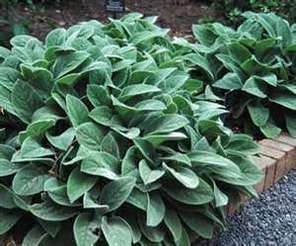 Big Lamb's Ear is a low growing spreader with very fuzzy, silver-green foliage. They are grown primarily for the color and texture of their foliage. It will rarely flower, but when it does flower, expect them to bloom during the summer with purple blooms. Big Lamb's Ear will grow from 6" to 12" tall and from 1' to 2' wide. It makes a great ground cover, spreading by creeping stems. Use Big Lamb's Ear in a children's garden because of their soft feel. Use this plant in a Cottage Garden or a Moon Garden. It is deer resistant, drought tolerant once it is established and is a Firewise plant.